Axis of Awesome shows how easy it is to create a hit song with a simple 4 cord progression. 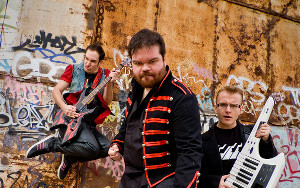 Learn about the magic of music from this Australian comedy group performing at the 2009 Melbourne International Comedy Festival. This simple four chord progression is the magical formula which countless hit songs have followed. So if you think all pop music sounds the same you might be on to something. Check out this mashup from Axis of Awesome called “Four Chords”. This entry was posted by Fresh Dub on March 20, 2015 at 12:35 am, and is filed under Music. Follow any responses to this post through RSS 2.0. You can leave a response or trackback from your own site.